Budget friendly standing desks tend to skimp on options and extras in order to keep costs low. If you need a basic standing desk with multiple tiers or the choice to add on a keyboard tray but don’t want to spend too much, consider the Stand Steady Tranzendesk 55″, a crank-operated manual sit-stand desk. 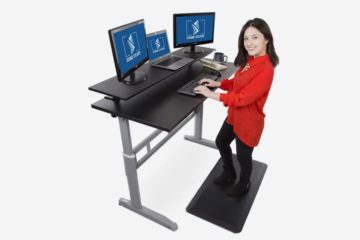 The specifications of this standing desk give the picture of a pretty standard two-tier standing desk that is not particularly outstanding in any way. This impression may not be far off, but remember that you are looking at a desk that is under $500, therefore very much an entry level full height adjustable desk. At this price level, the Tranzendesk has some pretty useful features for someone looking for a cheap entry point into a standing workstation. In my opinion, this is hands down the best feature of this standing desk. Regular standing desk users will know that one of the biggest challenges with standing desks is the management of space. There usually isn’t quite enough, especially in single tiered standing desks. After a desktop monitor, keyboard, mouse, mouse pad, pens, speakers, and router have been put in place on the table, finding space to squeeze in a mug of coffee or even a notepad may be a challenge! The Tranzendesk 55″ addresses this issue by offering a clamp on top-shelf with the main desk. You have a choice of two sizes. The large attachable shelf is 55 inches wide and 12 inches deep, approximately half the size of the main base desktop. There is a space of 4 inches in between the two tiers for you to fit in further equipment, perfect for that cup of coffee or tea! This ensures that no space goes to waste on this desk. The other option which is the small attachable shelf has dimensions of 48 inches by 10 inches. It is, therefore, a fair bit smaller than the large attachable shelf, meaning the weight capacity is lower as well at 35 pounds. If you need an attachable shelf to place monitors on, but you don’t want the top shelf to take over half the entire desktop, the smaller shelf can be a good option. There is the added ergonomic benefit of the shelf too. Often, our posture while using a standing desk is compromised when our hands are too high or the monitor is too low. We often recommend using a monitor arm to have full control over the monitor height, but in this case, the shelf also does a good job. If you would like to increase ergonomic adjustability by adding tiers below instead of above, there is also the choice of a clamp on keyboard tray. One user even praised the keyboard tray in the review, stating that it attaches firmly and does not shake while typing, something that can’t be said about all attachable keyboard trays. The dimensions of this tray are 27 inches by 12 inches, meaning it would fit even larger sized keyboards, like split ergonomic keyboards for example. As you can see in our list of 50 standing desks compared, many of the standing desks out there do not have the option of adding on a keyboard tray. To have this choice with the Tranzendesk 55″ is a definite plus point. The benefit of having a keyboard tray on a standing desk is not just limited to the extra desk space, but it also allows you to relax your shoulders more and drop your wrists lower into a neutral position as you work, removing a lot of stress from your wrists. In the Stand Steady Tranzendesk 55″, the keyboard tray is attached 6 inches below the work surface. Therefore, there will be ample space for you to relax your wrists and type in an ergonomically healthy position. Having both an upper tray AND a keyboard tray makes the desk very ergonomic. As I mentioned, this is an entry-level desk. 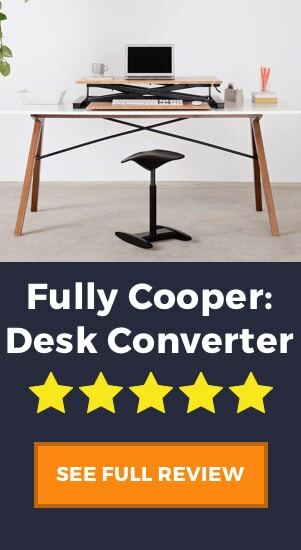 It offers a fair amount given its low value and could be considered among the best standing desks under $500 (that is, manual standing desks). For a high-quality manual standing desk with tiers and add-ons, this is really good value for money. It makes the Tranzendesk 55″ the perfect desk for the casual user or for a person who is not quite decided whether a standing desk is worth all the fuss and is not ready to spend thousands of dollars on a workstation. If you aren’t sure about standing desks in general we recommend you read about the benefits here. But make no mistake, inexpensive does not mean that build quality was compromised. This is a well-built standing desk. Users have consistently praised the solid build of this desk and how it does not wobble, even with more than one monitor on it. The frame is made of metal and the top is melamine coated particle board, both very durable materials(although maybe not the most stylish), and the desk should blend in with most office decor. Given some of the impressive features, the Stand Steady is great value for money. Putting together this standing desk should take up only around 30 minutes of your day. The manual that comes with the desk says that you need two people to put it together, but others have reported that it can be assembled alone without much difficulty (although just be careful with any heavy lifting, as you can strain your back). The overall shipping weight isn’t too heavy either at 66 pounds, and the free shipping is certainly appreciated. Standing desks can generally be grouped into two broad categories, electric and manual. For a detailed comparison of the two types, check out our article on electric standing desks versus manual standing desks. While electric standing desks are justifiably popular for their ease of use, the Tranzendesk 55″ falls into the latter category. In order to adjust the height of the desk to transition between sitting and standing, you have to use a manual crank. Like some users, you might find this to be a disadvantage, especially if you change the height a lot throughout the day. But if you are someone who is not too fussed about the hand crank, the lack of electronics does offer an advantage in that manual height adjustment mechanisms are far less likely to break down. 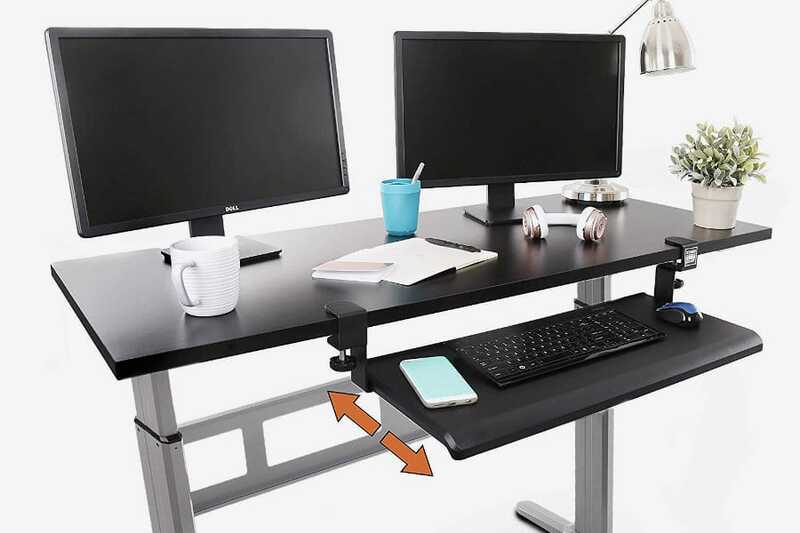 If it is important to you that your standing workstation is powered by an electric motor but needs to be still affordable, check out the FlexiSpot E1 Single Motor Standing Desk. It costs about the same as the Tranzendesk and also is one of our recommended cheaper desks. 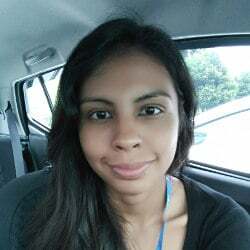 Click the above link to see a full product review. If you have lots of heavy equipment, this standing desk is not for you. With a weight capacity of just 80 pounds for the main desktop, this is fine for the light to average user. It is expected for a manual sit-stand desk to have a lower weight capacity, it is after all rather difficult to shift hundreds of pounds up and down using a manual crank. 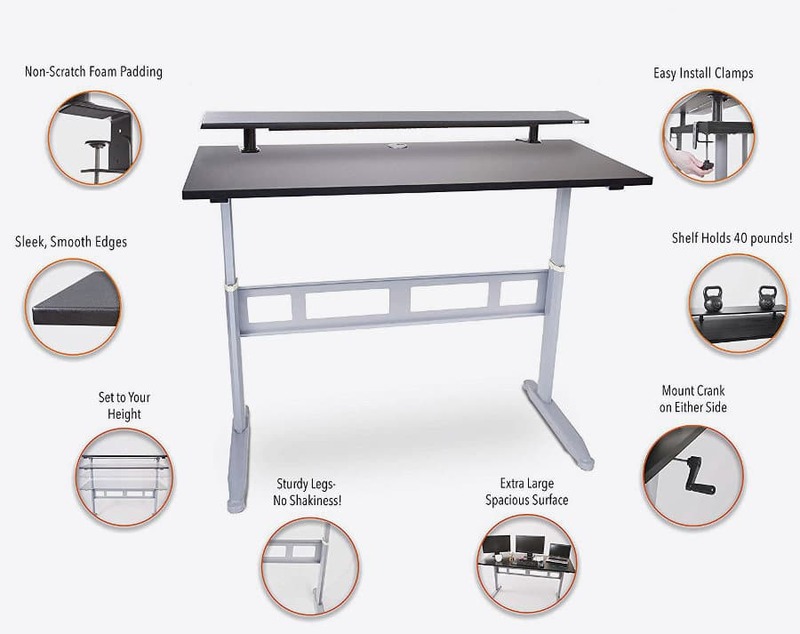 That being said, for a manual standing desk with better weight capacity, consider the ApexDesk AirDesk (180 pounds of weight capacity), or even the FlexiSpot H2 Crank which has a weight capacity of 176 pounds, with add-on casters to boot! If none of these weight capacities seem adequate to you, then we really think you’ll be better off with an electric standing desk. That brings us to our next point, the lack of casters on this standing workstation. This can be a problem or not an issue at all, depending on your needs. 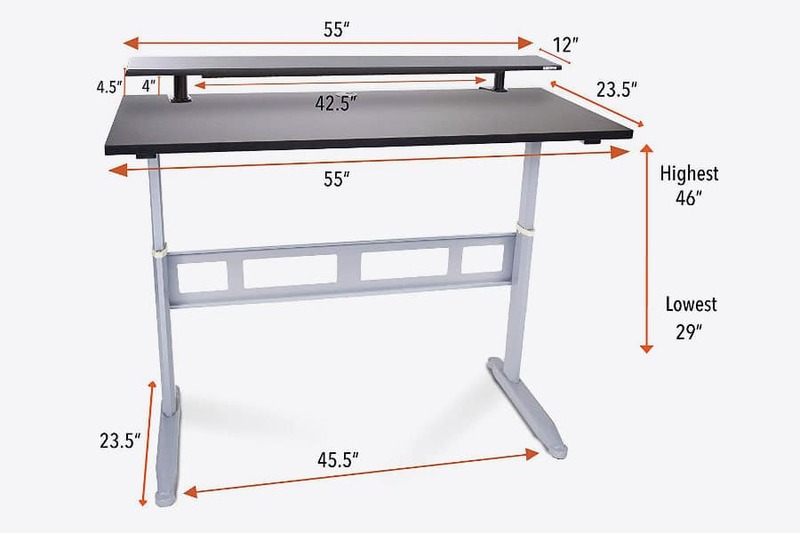 Dragging around a heavily loaded standing desk with no casters can be hard on the body and definitely not good for the back, so casters are a necessary feature to have for mobile standing workstations. 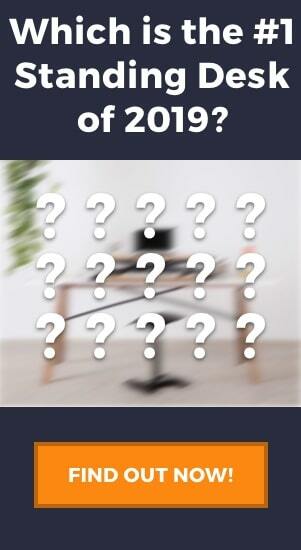 The question to ask yourself is, are you planning to move the desk about? If yes, then we highly suggest getting a standing desk with add on casters, such as the Stand Up Desk Store Crank Standing Desk which even comes with a similar 2 tier option, the aptly named Crank Standing Desk 2-tier. In summary, the Tranzendesk 55″ is a perfectly functional sit-stand desk. It’s great for first time users, people without many needs, or people who like manual standing desks. 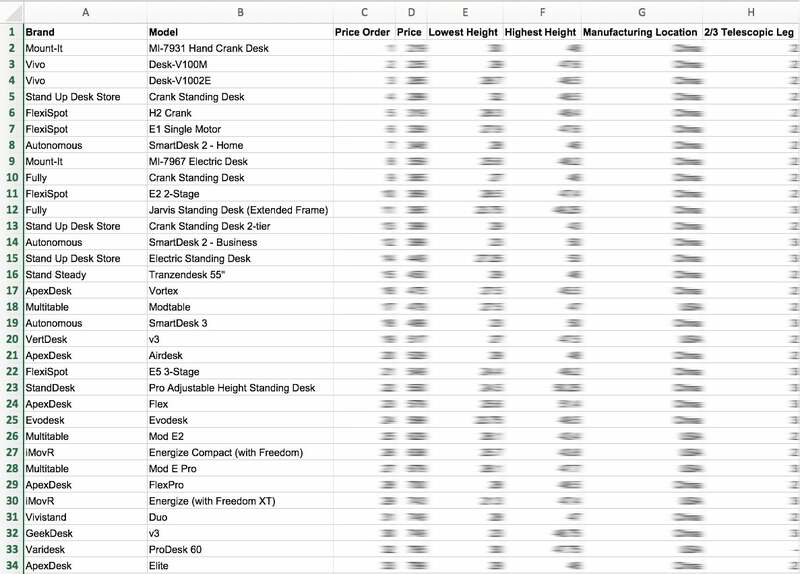 Put simply, if you don’t need a fancy desk with all the bells and whistles that come with the higher end models, and don’t want to spend $1000+, then Tranzendesk 55″ is a contender. Just be aware of the weight capacity and possible issues with moving the desk around. If these factors aren’t a priority to you, then the Stand Steady Tranzendesk 55″ is definitely worth a look.